7% Goods Service Tax (GST) will be imposed over the total invoice value if purchased locally in Singapore. However if you are a tourist visiting Singapore, this GST amount can be refunded at the Changi Airport GST Refund Centre before departure and this must be done within 30 days. Please note that only Foreigners / Tourists who have met the Tourist Refund Scheme's conditions and eligibility criteria can claim for the GST refund. Sony launched the impressive Sony HXR-NX5R Full HD Professional Camcorder. This professional camera comes as a perfect replacement for previous versions Pro camcorders like HXR-NX5, HXR-NX5U, and Sony HXR-NXCAM. This latest production features an array of spectacular specifications that makes it desirable for professional videography. From the lenses to the hardware components, this Sony professional video camera is almost irresistible. Sony HXR-NX5R camera boasts a record of 20 times zoom. That makes it a better Sony Pro camera compared to Sony HXR-NX5 when it comes to zooming experience. Also, the camera also features 40 times magnification capability. Ideally, that features makes it one of the best in the market on pixel counts. Sony HXR-NX5R also has an enhanced transparent display for better functionality. To make the most out of this incredible feature, it is advisable to take advantage of an ideal app called OLED VF. It focuses on providing enhanced color description of the resulting videos. 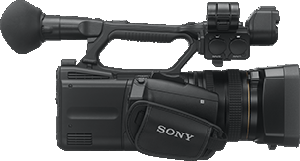 Unlike most pro camcorders that require connection to external media storage to enable transfer of files, this Sony HXR-NX5R latest camcorder enjoys an inbuilt Wi-Fi system. Taking advantage of this spectacular features means will now be able to upload the video contents using FTP wireless networks. Even better turning on the Wi-Fi enabled sharing via smart phones. This spectacular feature is not evident in other competing camcorders. The alternative sharing option is the USTREAM. This high-end product allows faster and flawless distribution of videos via USTREAM.. It is more of the passion and intense involvement. Nothing brings out that experience better than this professional camcorder. 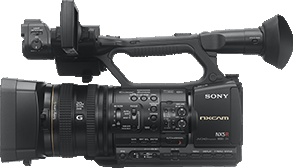 Sony HXR-NX5R grants the professional an opportunity of monitoring live video directly from the camera. With the start and stop recording buttons, you can now set up the camera, focus, and sit back. It also comes with advanced technology that enabled live streaming of movies to the external devices. Lastly, the camcorder enables the use of wireless microphones like UWP-D11. You would not need any cables or external batteries to use such earphones with this system. The Sony HXR-NX5R camera comes with 3G-SDI port, which offers better Full HD output functionality. For easier access without necessarily using the menu process, this professional piece comes with a joystick. This improved functionality enables easier capturing of more shots within a short time. Storage is yet another critical aspect that Sony HXR-NX5R takes into consideration. Sony HXR-NX5R camcorder comes handy with two SD card slots to enable increased recording time and recording flexibility. Even more resoundingly, the video camera is designed with minimum power usage in mind. 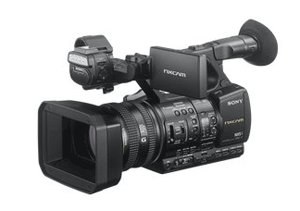 Sony HXR-NX5R choice of camcorder largely depends on one&apos;s niche. For professionals handling major cooperate events, weddings, graduation ceremonies, celebrity parties and commercial sports, a good choice of the camera with impeccable specifications is necessary. You need a camera with a longer battery life, enhanced storage capacity and one that guarantees quality shots. Most importantly, you need enhanced lighting for clarity of pictures and videos. Unlike its predecessors like Sony HXR-NX5 and Sony NXCAM, which required external lighting sources, Sony HXR-NX5R is a professional camcorder with built-in LED light. 1. FLANGE BACK Adjusting is supported. 2. The update of USTREAM Certificate List is supported. Please prepare the following items in addition to your camera. * Please close all other application software before updating the system software. * Core Solo and Core Duo processors are no longer supported. - When performing the system software update, please use the supplied AC adaptor. update doesn&apos;t work in case using battery. - Do not remove the AC adaptor during the update; otherwise, the camera may become inoperable due to the sudden power shutdown. - Remove the memory card / memory recording unit from the camera beforehand. - After update is completed, all setup returns to the default settings set at the factory. Note: After the update is complete, please do the date and time setting cycle the power of the camera body. From the first time i dealt with Expandore, i have never looked at any other company to buy my audio/visual equipment. Expandore is a one stop shop which gives its customers great price with excellent customer service. I have always dealt with Czarina Gano at Expandore, who has never let me down. She has always taken an extra step to assist me in all possible ways. Hats off to Expandore and Czarina for a job well done. Really satisfied with the service.